Yoga is the holistic approach to health focused cures to any issues. Stress is the most debilitating lifestyle disease of the current time and place. 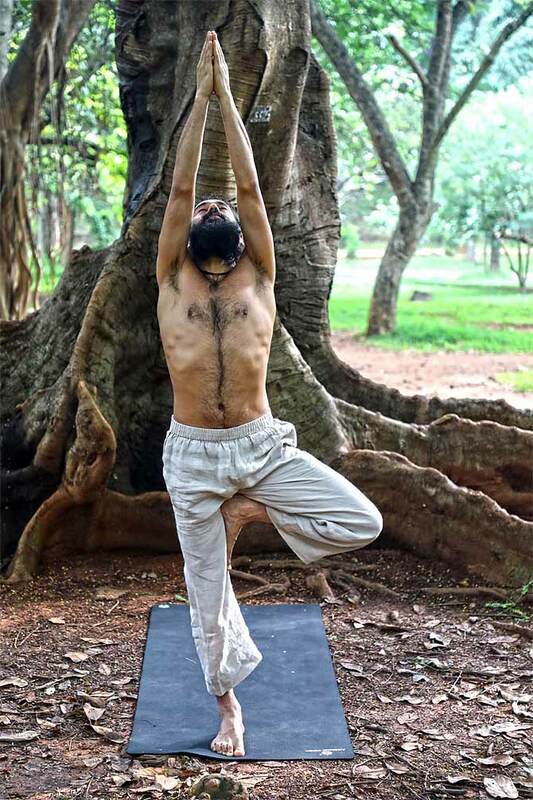 With these techniques and asanas, battling stress will no longer seem far fetched or cumbersome. Remove yourself from the usual surroundings where you generally experience stress. This is because the brain has created a pathway where it connects the place with stress. Work on the physical fitness of your body as this will send hormones running to the brain and the body which create happiness and satisfaction. It is also crucial to have a physically able body to reduce stress on the mind. Form a connection between your external environment and your internal self to bring harmony between the two. 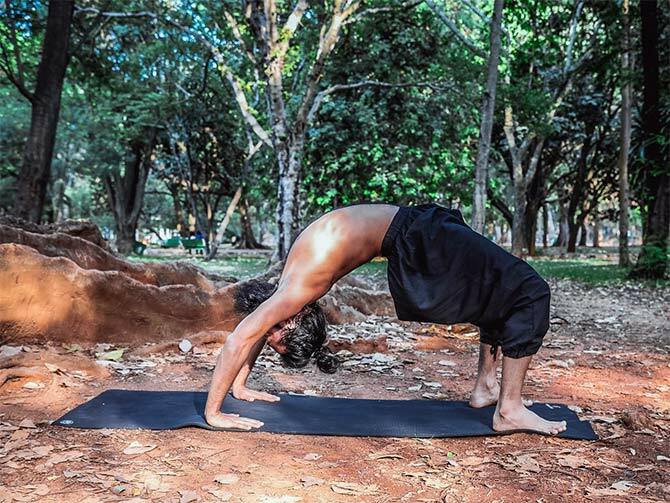 Introduce these asanas in your everyday practice to experience a positive impact on your body and even more importantly, your mind. Begin by sitting down on the floor with your legs stretched out forward. Place your palms firmly on the floor beside your hips. 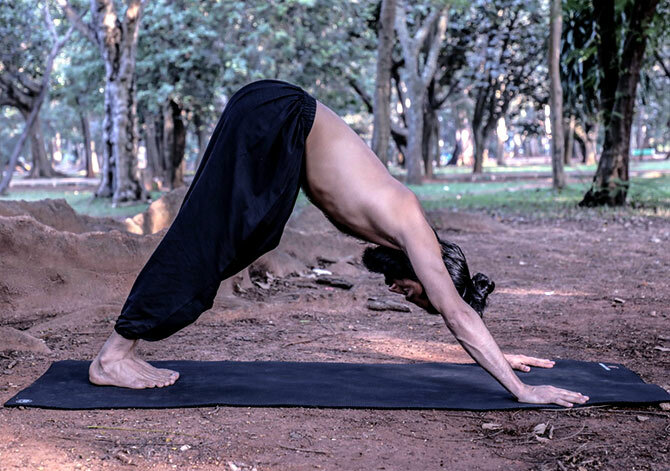 Move both feet backwards, lift the hips up, straighten the knees and elbows, and form an inverted ‘V’ shape. Now keep the hands shoulders width apart. Fingers point ahead. Put pressure on your palms and open your shoulder blades. Lift your heels off the floor and point them up, balancing your weight on your toes. Hold the position for a few seconds. Keep your eye focused on your big toes. Exhale as you enter into this posture. Inhale as you release from it. Ensure that your knees are slightly bent while your legs are stretched out forward. Extend your arms upward and keep your spine erect. Exhale and empty your stomach of air. With the exhale, bend forward at the hip and place your upper body on your lower body. Lower your arms and grip your big toes with your fingers. Try to touch your knees with your nose. Hold the asana for a while. Inhale while you lift your arms up. Exhale while you bend forward. Begin by standing in Samasthithi. Lift you left leg off the floor and balance your body weight on your right leg. Place your left foot on your right, inner thigh. Place it as close to your pelvis as possible. You may support your foot with your palms to bring it in place. After you find your balance, join your palms in Pranam Mudra at your heart chakra. Raise your Pranam towards the sky. Straighten your elbows and ensure that your head is in between your arms. Repeat the same with the alternate leg. Inhale and exhale normally while practicing this asana. Bring your Pranam back in front of your heart chakra. Lower your leg and place it back on the floor. Fold your legs at your knees and ensure that your feet are placed firmly on the floor. Bend your arms at the elbows with your palms facing the sky. Rotate your arms at the shoulders and place your palms on the floor on either side beside your head. Inhale, put pressure on your palms and legs and lift your entire body up to arm an arch. Look back and relax your neck as you allow your head to fall gently behind. Your body weight should be evenly distributed between your four limbs. Hold the posture for 30 seconds. Lower your body down on the floor. Stretch your legs forward and bring your palms beside your body in shavasana. Lift your upper body up into Dandasana. Bring both feet in between your palms into Padahastasana. Beginners to the practice of yoga must take their practice gradually. Always remain within the comfort levels of your body. Practitioners suffering from physical ailments must consult their doctors before they begin their practice. Regular practice of these asanas coupled by Bhastrika pranayama and meditation will give you a far more peaceful outlook, relieving you from stress, giving you a more fulfilling life.